Complex internal structure of cells depends on the functions that it performs in the body. However, the principles of all cells are the same. So, any live cell outside covered with plasma, or cytoplasmic, membrane. Cytoplasmic membrane has a thickness of 8-12 nm, so consider it in the light microscope is impossible. The structure of the membranes studied with the electron microscope. Plasma membrane consists of two layers of lipids – ulipinim layer, or bilayer. Each lipid molecule consists of a hydrophilic head and hydrophobic tail, and in biological membranes lipids located heads outward, tails inward. In silipigni layer immersed numerous protein molecules. Some of them are on the membrane surface (external or internal), while others permeate through the membrane. The membrane protects the contents of the cells from damage, supports cell shape, selectively transmits the necessary substances into the cell and removes metabolic products, and provides communication of cells among themselves. Barrier, otgranicennoe function of the membrane provides a double layer of lipids. He keeps the contents of the cells to flow, to blend in with the environment or intercellular fluid, and prevents the penetration into the cell of hazardous substances. A number of the major functions of the cytoplasmic membrane is carried out by proteins embedded in her. With the help of proteins-receptors, the cell can perceive the various stimuli on its surface. 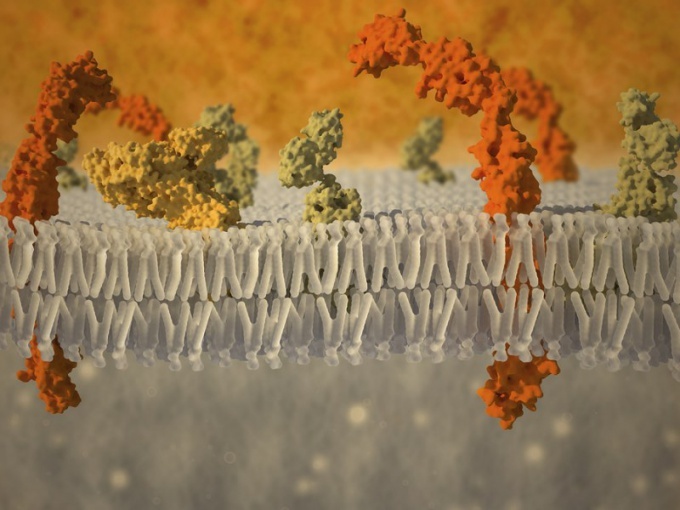 Transport proteins form thin channels through which the inside of the cell and out of it are ions of potassium, calcium, sodium and other ions of small diameter. Proteins-enzymes ensure the life processes in the cell itself. Larger food particles not able to pass through the thin membrane channels, fall into the cell by phagocytosis or pinocytosis. The General name for these processes – endocytosis. Food particle comes in contact with the outer cell membrane, and in this place formed invagination. Then the particle is surrounded by a membrane, enters cells, produces digestive vacuole, and inside the resulting bubble penetrate digestive enzymes. The blood leukocytes, is able to capture and digest foreign bacteria, are called phagocytes. In the case of pinocytosis by invagination of the membrane is not captured solid particles and liquid droplets with dissolved substances. This mechanism is one of the main ways of penetration of substances into the cell. Plant cells, covered with a membrane on top of the rigid layer of cell walls are not capable of phagocytosis. The reverse process to endocytosis, exocytosis. Synthesized in cell substances (e.g., hormones) are packaged in membrane vesicles are suitable to the membrane, embedded in it, and the contents of the vial is ejected from the cell. In this way the cell can get rid of unnecessary metabolic products.